Unless you have been hiding under rock, you have probably have already heard that President Obama during an interview on ABC News came out in favor of gay marriage (coming in right behind Vice Pres Joe Biden’s supportive backing earlier in the month). 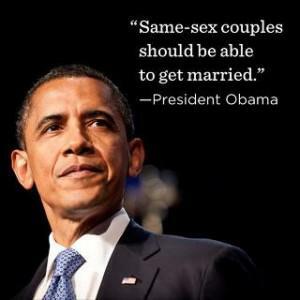 During the interview with news spokesperson, Robin Roberts (how apropos), Obama admitted to how his opinion has evolved since his last stance on civil unions versus gay marriage. It didn’t take long for the news to make the media waves; while most of the results were positive — it didn’t take long for Obama’s opponents to throw their opinions out there. Citing that Obama’s latest revelation was nothing but a “ploy” to swing more support from the LGBT community, the bulk believed that it would take more than Obama’s approval of LGBT marriage equality to squeeze out more votes come election time.